Iriomote is the second largest island in Okinawa Prefecture, and the largest of the Yaeyama archipelago, in southern Japan. The island has just over two thousand permanent residents, with seasonal visitors flocking here in figures well over a hundred and fifty thousand, outnumbering locals by almost a hundred to one. It manages to attract such numbers due to its reputation as one of the last true wildernesses of Japan, with about ninety percent of it blanketed in dense jungle and mangrove trees, which are mostly part of a National Park. Given its unspoilt, sub-tropical landscape, Iriomote is inhabited by a rich and varied wildlife, the most fascinating being the critically endangered namesake wildcat, usually only seen at night crossing the roads. The Wildlife Center, outside the southern port town of Ohara, showcases everything you need to know about the local plants and animals. For a more hands-on approach to Iriomote’s nature, you can dive into some of the most colourful coral reefs in Japan, mostly off the south coast, and swim with dolphins and manta rays in the summer. 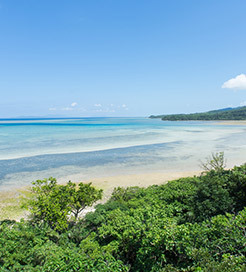 Offering plenty for the avid sun-seeker, Iriomote has some immaculate beaches. Famed for its ‘star sand’, Hoshinozuna Beach is actually made up of tiny skeletons from miniscule marine creatures, while the classically tropical Funauki Beach is widely regarded as one of the most picturesque in the country. A number of rivers meander deep into the island, much resembling the Amazon Rainforest, offering the best way of venturing through the forests, via kayak or riverboat. From the banks of the Hinair and Urauchi Rivers, the largest in Okinawa, you can hike up one and a half kilometres to the Kampire, Mariudo and Pinaisara waterfalls; the latter of which is the tallest in the prefecture and arguably the island’s finest natural feature. Getting the ferry to Iriomote Island? With a couple of ports to sail to, situated on both the north and south coasts, getting to Iriomote Island by ferry is simple, with fast and frequent crossings from Hatoma, Ishigaki and Kohama Island. The fastest available crossings last just fifteen minutes, operated by a choice of excellent ferry companies. For more information, please visit our Ferries from Okinawa to Iriomote Island page.